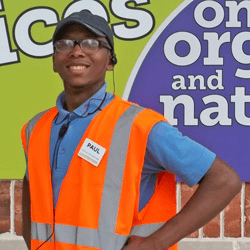 "I wanted to send in a rave review concerning one of your employees at Harris Teeter. There have been multiple times that I have thought what a wonderful, happy, helpful person Paul is; however, today he went above and beyond for me and my daughters. To start, he's a familiar face and so easy to remember because of his fabulous attitude and easy-going demeanor. I was in a running group, and Paul would be walking into work as we began our runs and he would clap and cheer us on even though it was 8 am. He also is always super sweet to my daughters and cheer them on when he sees them in their soccer uniforms. Today, my 2 and 3 year olds were in the worst moods. It was a mom nightmare. Paul said to hold on, even as he was bringing in a ton of carts (working overtime to help), and he ran back out to get the cart with the driving car attached to it. It's the only thing that gives me a chance when shopping with my girls when one is in meltdown mode. While shopping, he helped me several times and had only encouraging things to say when I was nearly in tears. When I checked out - there he was. He insisted on helping me with my groceries. He pushed the cart for me and waited for the girls to get their cookies. He took us all the way to my car, cheerful as ever, making my day so much brighter and easier. He made my kids laugh - the just love him! He let me get the girls in their car seats while he put all my groceries in my car and then took the cart back for me. There are literally not enough wonderful things that I could say about this young man. He's everything I would think any employer would want in an employee and is a complete inspiration in just plain old happiness. I truly love Harris Teeter, but Paul makes everything just that much better. I hope that in some way it can be taken to heart and heard that I truly saw him as my shopping guardian angel today :) Without him, we'd have probably all ended up just leaving the store foodless and in tears or, at the very least, totally frazzled. Because of Paul, my shopping is done, we all left laughing, and I felt lighter and able to face the rest of what needed to be done for a mother of four for the rest of the evening. I called as soon as I left to let his immediate manager how grateful I was for Paul, and I wanted to make sure corporate also knew how incredible he is." 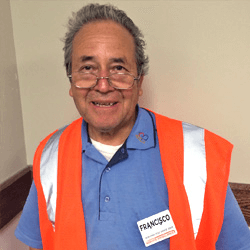 "I had the most wonderful shopping experience today thanks to an employee named Francisco. I have twins and could not find a double cart to shop with them. Francisco was asked to help me and he searched for the cart and when it couldn't be found he offered to walk around with me to help push the cart while I pushed my stroller. He then helped me get my bags to my car; all while entertaining my kids and being all around friendly and helpful. It is really stressful to shop with twin toddlers and he did everything he could to help make the situation easier for me. I hope he can be recognized in some way. Thanks, Francisco! I will definitely be returning to Harris Teeter." "I shop at the Harris Teeter store. It is a pleasure to shop at this store because everyone working there is helpful, caring and wonderful people. 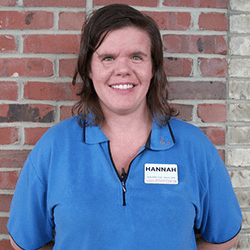 I have to tell you my experience from a few weeks ago with an employee named Hannah. I go to Harris Teeter 2 to 3 times a week and always end up at customer service to play my lottery tickets. Hannah and I got into a conversation and that day was one of my sad days. I told her about the death of my son Paul. On January 6th, my son had a massive heart attack and died. Paul woke up happy that morning and showed no sign of being sick. A few hours later he complained of a headache and within 10 minutes he died. Tears came to my eyes and Hannah came around to the front of the counter and told me to follow her. We walked to the front of the store and she told another employee to go get me something. She came back with a vase of flowers. I was shocked, but also happy. She said it was from everyone. I cried all the way home. I want to say thank you to Harris Teeter and all of their employees. Thanks to the store manager for all his good work."